Llanfairpwllgwyngyllgogerychwyrndrobwllllantysiliogogogoch (Welsh pronunciation: [ˌɬanvairˌpuɬɡwɨ̞ŋˌɡɨ̞ɬɡoˌɡɛrəˌχwərnˌdrobuɬˌɬantɨ̞ˌsiljoˌɡoɡoˈɡoːχ] ( listen)) is a lairge veelage an commonty on the island o Anglesey in Wales, situatit on the Menai Strait next tae the Britannia Brig an athort the strait frae Bangor. This veelage haes the langest place name in Europe an ane o the langest place names in the warld. The short form o the veelage's name is Llanfairpwllgwyngyll, spelt Llanfair Pwllgwyngyll an aw. 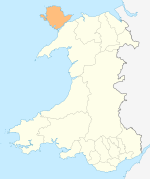 It is commonly kent as Llanfair PG or Llanfairpwll. Accordin tae the 2001 census, the population o the commonty is 3,040, 76% o wham speak Welsh fluently; the heichest percentage o speakers is in the 10–14 age group, whaur 97.1% can speak Welsh. It is the fift lairgest dounset on the island bi population. Visitors stap at the railwey station tae be photografit next tae the station sign, veesit the nearbi Visitors' Centre, or hae 'passports' stampit at a local shop. Anither tourist attraction is the naurhaun Marquess o Anglesey's Column, whilk at a hicht o 27 metres (89 ft) affers views ower Anglesey an the Menai Strait. Designed bi Thomas Harrison, the monument celebrates the heroism o Henry Paget, 1st Marquess o Anglesey at the Battle o Waterloo. The lang form o the name is the langest offeecially recognisit place name in the Unitit Kinrick an ane o the langest in the warld, bein 58 characters in lenth (51 letters syne "ch" an "ll" are digraphs, or single letters, in the Welsh leid). 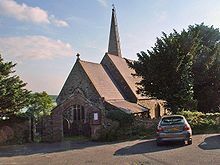 The name means: [St.] Mary's Kirk (Llanfair) [in] the howe (pwll) o the white hazel (gwyngyll) near (goger) the rapid whirlpuil (y chwyrndrobwll) [an] the kirk o [St.] Tysilio (llantysilio) wi a reid cave ([a]g ogo goch). This veelage wis oreeginally kent as Llanfair Pwllgwyngyll (an is whiles still referred tae as Llanfairpwllgwyngyll) an wis gien its lang name in the 19t century in an ettle at developin the veelage as a commercial an tourist centre (see Significance o the name belaw). Thir days, the veelage is still signpostit as Llanfairpwllgwyngyll, merkit on Ordnance Survey maps as Llanfair Pwllgwyngyll an is kent tae locals as Llanfairpwll or simply Llanfair. The name is seen shortened tae Llanfair PG, whilk is sufficient tae distinguish it frae the mony ither Welsh veelages wi Llanfair in thair names. Ither variant forms uise the fou name but wi tysilio mutatit tae dysilio, an/or wi a hyphen atween drobwll an llan. In Welsh, the initial Ll mey be mutatit tae a single L in some contexts. The veelage's lang name canna be conseidert an authentic Welsh-leid toponym. It wis airtificially contrivit in the 1860s tae bestow upon the station the honour o haein the langest name o ony railwey station in Breetain; an early insaumple o a publicity stunt. The veelage's ain wabsteid credits the name tae a souter frae the local veelage o Menai Brig. Accordin tae Sir John Morris-Jones, the name wis creaut bi a local tylor, whase name he didna confide, lattin the secret dee wi him. The current postmark shaws the name Llanfairpwllgwyngyll, Housomeivver, thare contemporary insaumples o the fou name seen ablo. The veelage wis oreeginally kent as 'Llanfair Pwllgwyngyll' "St Mary's kirk in [the tounship named] howe o the white hazel." 'Pwllgwyngyll' wis the oreeginal mediaeval tounship whaur the veelage is the day. Auld variants (wi the Welsh spellin normalisit) wur Llanfair y Pwllgwyngyll ("y" = '(o) the'), an Llanfair Ymhwll Gwyngyll ('mh' is a sandhi chynge frae 'n p', an "yn" = 'in'). The veelage is split intae twae smawer veelages, Llanfairpwllgwyngyll-uchaf (Upper Llanfairpwllgwyngyll) the oreeginal pairt o the veelage an Llanfairpwllgwyngyll-isaf (Lawer Llanfairpwllgwyngyll) the newer aurie nearer the railwey station. Thae are occasionally referred tae as Pentre Uchaf an Pentre Isaf (Upper Veelage an Lawer Veelage) respectively. James Pringle Weavers shop wi Inglis translation o the name. The fou name o the veelage is [ˌɬanvairˌpuɬɡwɨ̞ŋˌɡɨ̞ɬɡoˌɡɛrəˌχwərənˌdrobuɬˌɬantɨ̞ˌsiljoˌɡoɡoˈɡoːχ], or wi [ɪ] for [ɨ̞], [pʊɬ, bʊɬ] for [puɬ, buɬ], dependin on the speaker's accent. Male Welsh speaker pronouncing Llanfairpwllgwyngyllgogerychwyrndrobwllllantysiliogogogoch. The approximate pronunciation in Inglis orthografie is gien at the station as: Llan-vire-pooll-guin-gill-go-ger-u-chwurn-drob-ooll-llantus-ilio-gogo-goch. The ch is a voiceless uvular fricative [χ] or voiceless velar fricative as in "Bach" ([bax]: see ach-Laut) in maist varieties o German. The ll is a voiceless lateral fricative [ɬ], a soond that disna occur in Scots an is whiles approximate as [θl] (thl as in athlete) or even [xl] bi Inglis speakers. Thare is even a sang on iTunes wi a lesson on hou tae pronoonce the name. The Carmarthenshire veelage o Llanfynydd unoffeecially adoptit the name Llanhyfryddawelllehynafolybarcudprindanfygythiadtrienusyrhafnauole in 2004 in protest o plans tae erect a naurhaun wind ferm (the name means "a quiet bonnie veelage; a historic place wi rare kite unner threat frae wretched blades"). A station on the Fairbourne Railway wis namit Gorsafawddacha'idraigodanheddogleddollônpenrhynareurdraethceredigion (translatit as "the Mawddach station an its draigon unner the northren peace o the Penrhyn Road on the gowden beach o Cardigan Bay") for promotional ettles. Nae sic attempts hae gained widespread recognition amangst offeecial bodies or transport authorities. A dounset haes existit on the site o the veelage syne the Neolithic era, wi subsistence agriculture an fishin the maist common treds for a feck o the veelage's early history. The island o Anglesey wis at that pynt anly reachable bi boat athort the Menai Strait. The aurie wis briefly invadit an captured bi the Romans unner Gaius Suetonius Paulinus, temporarily abandoned fur tae consolidate forces again Boudicca, then held til the end o Roman Britain. Wi the withdrawal o the Roman forces, the aurie fell unner the control o the Kinrick o Gwynedd, an early Medieval kinrick. Unner this feudal system, the residents workit on wee ferms for the keing. The rural naitur o the dounset meant that the veillage haed a population o anly aroun 80. Housomeivver, wi the introduction o estates in the 16t century, hintle o the laund wis absorbit intae the Earldom o Uxbridge, currently unner the Marquess o Anglesey; the indwallers became tenant farmers on enclosurs. The population o the veelage boomit, wi a population o 385 in the 1801 census. 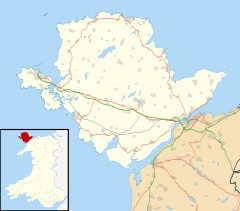 In 1826, Anglesey wis connectit tae the rest o Wales bi the construction o the Menai Suspension Brig bi Thomas Telford, an connectit wi Lunnon in 1850 wi the biggin o the Britannia Brig an the busy North Wales Coast railwey line, which connectit Lunnon tae the ferry port o Holyhead. The veelage decentralisit, splittin intae Upper Veelage (Pentre Uchaf), which wis made up mainly o the aulder hooses an ferms, an the new Lawer Veelage (Pentre Isaf), biggit aroond the railwey station an consistin maistly o shops an wirkshops. The veelage became a hub o commerce, as the railweys an road netwirk brocht traders an customers frae athort north Wales. The first iver meetin o the Women's Institute teuk place in Llanfairpwll in 1915 an the muivement (which began in Canadae) then spread throu the rest o the Breetish Isles. The name is celebratit in the sang "Red Cave" bi the baund Yeasayer, whilk featurs the baund repeatin the lines "Mary's house in the hollow of the white hazel rapid whirlpool and the church of the red cave." The name wis uised in the film Barbarella an aw as the passwird for the heidquairters o Dildano, the comical revolutionar an bi Peter Sellers in the film The Road to Hong Kong whaur he plays a quack doctor who asks Bob Hope tae say it insteid o the mair uisual 'Ahh' whan examinin his teeth. The name wis uised as a solution in a crosswird compiled bi Roger Squires for The Telford and Wrekin News whan ryalty visitit Ironbridge in 1979 on the occasion o the 200t anniversary o the first iver brig made o iron. The Telford & Wrekin askit for it sae it wad be acceptit bi Guinness Records as the langest wird tae appear in a published crosswird. It wis deemit necessar tae mak it an anagram: “Giggling troll follows Clancy, Larry, Billy and Peggy who howl, wrongly disturbing a place in Wales (58)”. The sang "The Boy From..." bi Stephen Sondheim an Mary Rodgers featurs the place name juxtaposed wi a seimlarly lang, but fictional, Spainyie place name. The 2012 expansion pack tae Civilization V, Gods an Kings, adds a Steam Achievement cried "Longest. Name. Ever." The image that accompanees this contains the letters "...pwllgwyngyll", the last 12 letters o the short version. ↑ Melville Richards, 'Place Names', in An Atlas of Anglesey (Anglesey Community Council. Llangefni, 1972). The late Professor Melville wis ane o Wales' leadin authorities on place names.